The Keystone Steele City pumping station, into which the planned Keystone XL pipeline would connect to, is seen in Steele City, Neb. The saga of the Keystone XL crude oil pipeline continues. This month, the U.S. Court of Appeals for the Ninth Circuit upheld an injunction on Keystone XL's construction. The injunction, granted by a federal judge in Montana, relied on the same inaccurate rhetoric often employed by the pipeline's opponents. The judge is needlessly depriving Americans of solid jobs and economic growth. Initially proposed in 2008, Keystone XL will connect oil sands in Alberta, Canada, to refineries in Texas. Spanning 1,700 miles and crossing half a dozen states, the Pipeline is expected to transport up to 830,000 barrels of crude oil every day. TransCanada, the company behind the pipeline, spent years navigating regulatory review. Then, in 2015, it fell to the Obama State Department to give the final green light for construction. Officials waffled for months before finally denying approval. Secretary of State John Kerry was blunt about why: "Moving forward with this project would significantly undermine our ability to continue leading the world in combating climate change." Approving a large new fossil fuel project would, apparently, be bad for America's image. On the campaign trail in 2016, President Trump promised to reverse this decision. He quickly made good on his word, issuing an executive order approving Keystone construction just one week into his term. The country was set to reap enormous economic rewards. The State Department predicts that pipeline construction will create some 42,000 jobs and add over $3 billion to the economy. Predictably, environmentalists pushed back, suing in federal court to stop construction. And sure enough, their gambit worked. In early November, U.S. District Court Judge Brian Morris ruled in favor of a group called the "Indigenous Environmental Network." Judge Morris wrote that federal regulators "acted on incomplete information" when they approved the pipeline and ordered a halt to construction pending additional environmental review. Rather than issuing a sound legal opinion, Morris simply rehashed the same litany of long-debunked activist complaints against the pipeline. First, Morris claims that the previous assessment of Keystone XL's "climate-related impacts" is not a "reasoned explanation." He's referring to a 2014 analysis from the Obama State Department, which found that Keystone XL would have virtually no impact on national emissions. That assessment's logic is airtight. About 200,000 barrels of Canadian crude are getting transported to Texas refineries whether or not Keystone is built. That oil will be refined and burned — the question is, how will it get there? Morris makes a similar complaint about the supposed inadequacy of official assessments of the risks of spills and leaks. Apparently, State analysis of the "modeling of potential oil spills and recommended mitigation measures ... fell short of a 'hard look.'" Keystone has been subjected to not one but six separate environmental impact reviews. Each one found it safe. 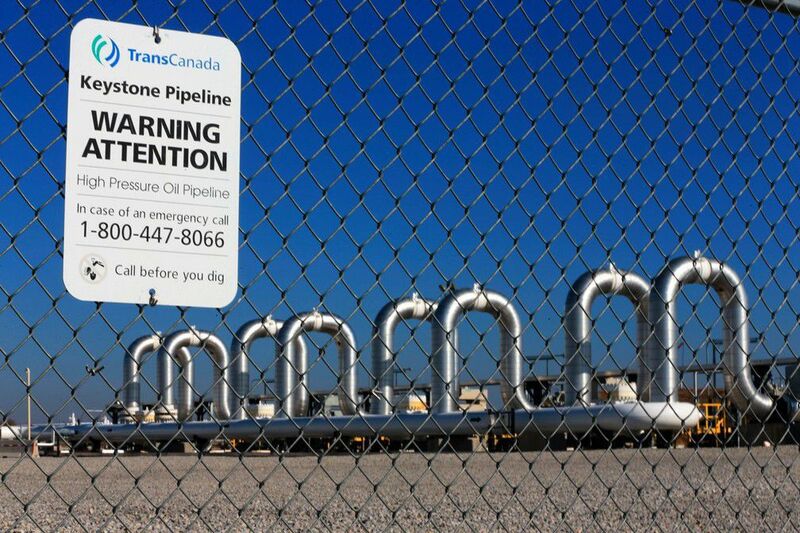 And TransCanada has made extra effort to ensure pipeline integrity, promising to install a state-of-the-art monitoring system spanning 16,000 data points that update in real time. The company has also adjusted the pipeline path to run even deeper underground and to navigate around fragile sandhills in Nebraska. The irony is that preventing pipeline construction could do serious environmental damage. Today, Canadian oil is primarily transported by freight train, which is significantly riskier than a pipeline. A train has a lot more moving parts and potential points of rupture. The Fraser Institute, a Canadian think tank, has calculated that transporting oil by pipeline is roughly five times safer than by rail. President Trump promised to bring the Keystone XL saga to a close. He's trying to make good on that promise, but now the courts, clearly driven by partisan bias, are doing their best to prevent the country from realizing Keystone's huge economic rewards. The president called the ruling "a political decision" and "a disgrace." Even his most vociferous critics would have to admit he's right. Allen Fuller is executive director of Principles That Matter, a Colorado-based nonprofit organization committed to advancing free market principles.